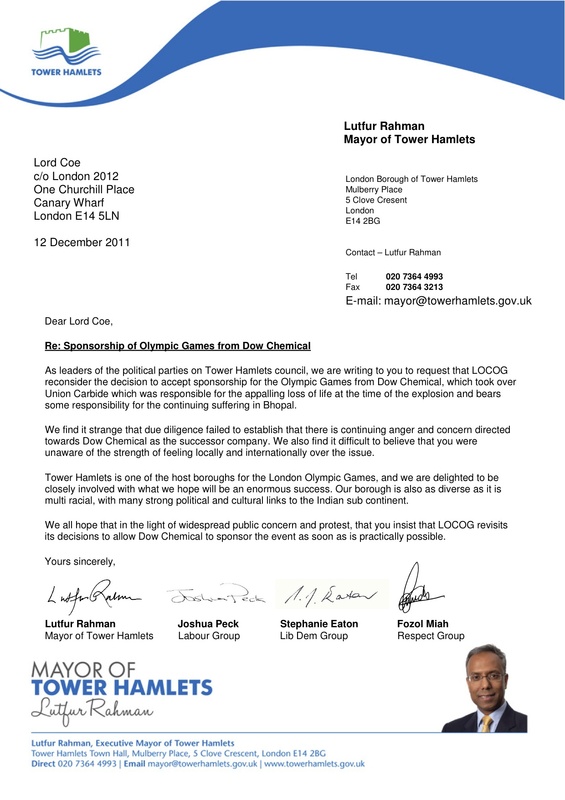 Following a suggestion made on this blog, the leaders of the Lib Dems, Labour and Respect parties in the host Olympic borough of Tower Hamlets have joined Mayor Lutfur Rahman in writing to Lord Coe to ask him to drop Dow Chemical as a sponsor of the 2012 stadium. Only Peter Golds, the Tory group leader, has declined to add his name. To have done so would have gone against his party whips at Westminster. I suspect his private views are like many others on this issue: incredulity that Coe has made such a pact. Here is the joint letter, the first of its kind under Lutfur’s mayoralty. As leaders of the political parties on Tower Hamlets council, we are writing to you to request that LOCOG reconsider the decision to accept sponsorship for the Olympic Games from Dow Chemical, which took over Union Carbide which was responsible for the appalling loss of life at the time of the explosion and bears some responsibility for the continuing suffering in Bhopal. We find it strange that due diligence failed to establish that there is continuing anger and concern directed towards Dow Chemical as the successor company. We also find it difficult to believe that you were unaware of the strength of feeling locally and internationally over the issue. Tower Hamlets is one of the host boroughs for the London Olympic Games, and we are delighted to be closely involved with what we hope will be an enormous success. Our borough is also as diverse as it is multi racial, with many strong political and cultural links to the Indian sub continent. We all hope that in the light of widespread public concern and protest, that you insist that LOCOG revisits its decisions to allow Dow Chemical to sponsor the event as soon as is practically possible.